Right behind the Boston Athenaeum, you will find Granary Burying Ground. The burial ground was established in 1660 and was initially part of Boston Common. However, in 1662 a granary, a jail, and some office buildings were built and separated the burial ground from the park. The burial ground is the final resting place to famous patriots such as John Hancock, Samuel Adams, Paul Revere, and James Otis. The five victims of the Boston Massacre also are buried there as well as eight governors and the woman who is alleged to be Mother Goose. 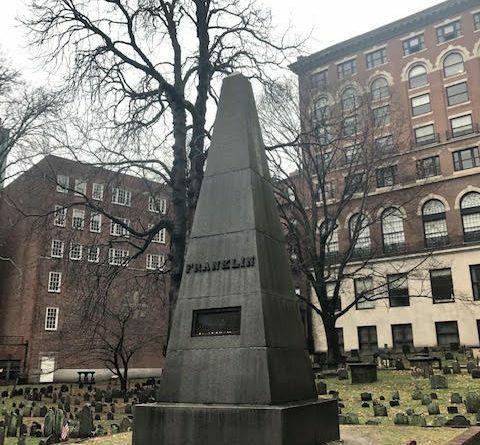 Benjamin Franklin’s parents are buried in the middle of the burying ground. You can’t miss the large monument dedicated to Josiah and Abiah Franklin since it is the largest structure on the property. There are 2,345 grave markers in Granary burial ground, but it’s believed that over 5,000 people are buried there. Markers have been moved over the years, and just because you see a headstone with someone’s name on it, it doesn’t mean that is where they are buried. In 2009, a tourist visiting the burial ground accidentally found an unrecorded crypt when they fell through the ground and onto the staircase leading toa even more unrecorded bodies. Due to all the people buried at Granary Burying Ground, it’s really no wonder locals believe it’s haunted. With headstones moved around and bodied buried on top of each other some of the dead here have not found peace. Typically, most photographs taken in the burial ground have some orbs in them. In fact, some people have claimed to see strange lights going in and out of the headstones at night. Cold spots are also commonplace at Granary. On a hot summer day, you can walk around the burial ground and suddenly hit a cool spot and feel a chill. 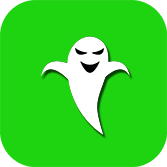 That’s supposedly an indicator of a ghostly presence. Take a tour of Granary Burying Ground and over 40 other haunted places in Boston for only $1.99 with the Boston Ghost Map available now in iTunes!